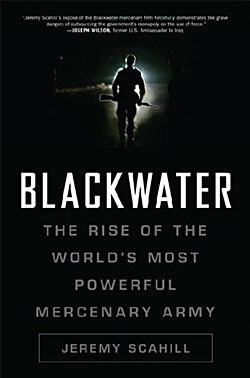 One of the sub-plots is the governments use of mercenaries (euphemistically called “Private Contractors”) and this prompted me to collect a list of resources on this topic. Mercenary armies have been used throughout the ages to supplement a nations own defense force or do a countries dirty work at an arms length. The difference now is that countries across the world are using mercenaries more and more for core functions and because these mercenaries are often beholden to no one, subject to no laws and immune from prosecution they can wreak havoc with no repercussions. In the video below The Daily Show’s Jon Stewart interviews Douglas Farah, a co-author of the book “Merchant of Death: Money, Guns, Planes, and the Man Who Makes War Possible” about the gunrunner and transportation/logistics mercenary Victor Bout. Washington Post TO VIKTOR GO THE SPOILS: War and Terror Inc.